It was a close call for a Boca Raton couple when their BMW caught fire on Christmas night. 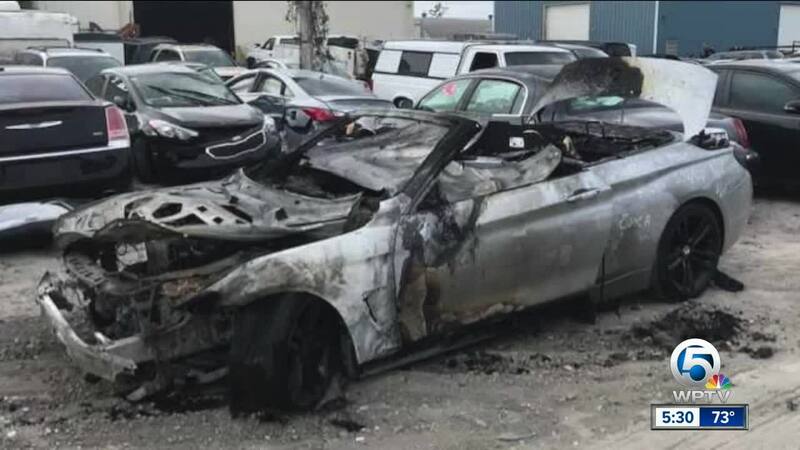 Luckily, the husband and wife were able to escape, but it comes after automaker BMW expanded a recall. BOCA RATON, Fla. — It was a close call for a Boca Raton couple when their BMW caught fire on Christmas night. Luckily, the husband and wife were able to escape, but it comes after automaker BMW expanded a recall. "The car was just engulfed after a minute or so, and you could hear almost like fireworks exploding," said Judy Weiner. Judy and Paul Weiner said it looked like a scene out of a movie. Without warning, they said their 2017 BMW 430i burst into flames on their way home Christmas night. "The smell alone in the beginning was like burning rubber, that’s what made me think it was like a plastic bag, but then it got stronger," said Paul Weiner. The couple was visiting family in the Boca Delray Country Club. Paul said he first smelled smoke and then he saw the flames. "Slowly under the hood you see the flames coming up and start to spread, and you hear a couple pops of the tires," Paul Weiner said. When firefighters arrived they said the BMW was fully engulfed. The vehicle is totaled and looks like a burnt out shell sitting in the lot at Sisters Towing & Transportation in West Palm Beach. "I just felt very lucky that we were able to get out and be safe because it was very scary," Judy Weiner said. Recently, BMW expanded a recall covering 1.6 million vehicles worldwide due to possible fluid leaks that could lead to a fire. The recall includes BMWs made between 2010 and 2017. It’s unclear what caused the Weiner’s car to catch fire, but they want people to be aware of the close call. "As bad as it was to see that happen is as good as it was to be able to walk away from it in one piece," Judy Weiner said. In a statement from the recall, BMW said customers with affected cars would be contacted. WPTV checked online using the Weiner’s vehicle identification number, and it said there were no open recalls. The Weiner’s said BMW and their insurance company are now investigating.